Beautiful Buildings in Quebec City, the capital of the province which with it shares its namesake is by far one of the most important cities in French speaking Canada. Quebec City is filled with architectural history of its colonial fur-trading days. 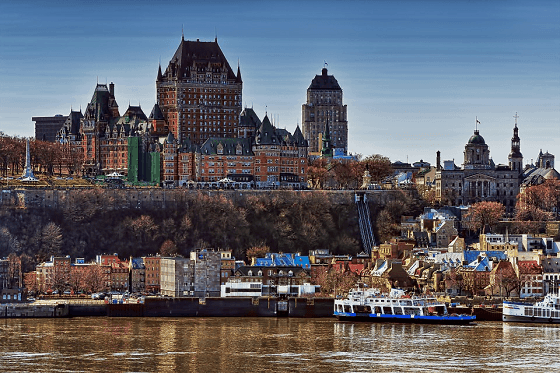 Whether you are an expert in the world of architecture, or just a traveler who likes to admire beautiful buildings around the world, Quebec City is sure to take your breath away. With a quick search on sites like Expedia, it’s easy to book cheap Quebec City flights, so you can take the first step towards your newest adventure. La Citadelle is the largest military fortification in North America. Established in 1750 by the French and later finished by the British from 1820-1850, it is a sight to behold. This fort features star shaped fortifications that are now a home to military memorabilia and artifact. It overlooks the beautiful St. Lawrence River and features guided tours and a museum area for those interested in learning more about the history of the city. In the summer months you can experience regular changing of the guard ceremonies. This is the oldest military building in Canada and now acts as a second home to the Canadian monarch and the Governor General of Canada. Over 200,00 people come to see the beautiful building each year. The history that you can experience and sights to take in from this building are endless. La Citadelle played an important role in the fur-trading colonial days, and plays an even more important role now. Considered to be one of the most important historical sites in the city of Quebec, L’Hôtel du Parlament his is one of the very few buildings in North America that features a Second Empire architectural style. The building contains four wings, measuring at about 100 meters each, that form a large square. You can take a tour of this building, which includes a close look at the National Assembly Chamber. 24 statues of important historical figures can be seen on the facade of this building. One of the most unique things about this building is the fact that it is still used for its original purpose. To this day, the Legislative Council Chamber still holds standing committees, just as it has since 1968. If you want to dig into the government history of the city, this building is the place to go. Château Frontenac dates back to 1893 and is recognized as one of the most commonly photographed hotels in the world. The hotel sits at an elevation of 177 ft. and it is a clear part of the Quebec skyline, seen over the St. Lawrence River. The impressive building was designed by Bruce Price in 1893. The original goal of the hotel was to promote luxury tourism to wealthy tourists by having a very upscale look and feel. Towers and turrets cover the building, giving it a picturesque fairy tale appearance. In 1993, the hotel was featured on a stamp in Quebec and it has also been featured in several notable movies including Alfred Hitchcock’s film “I Confess”. Although the hotel can be seen from miles away across the skyline, getting a closer look will bring you an even greater appreciation for this great work of architectural engineering. The Place Royale is one of the most historic landmarks in Canada, dating as far back as the 17th century. The area is made up of a series of buildings which are now various shops, cafes, and museums, but most notably is the Notre-Dame-des-Victoires Church. Built in 1688, this is the oldest stone church in North America. The Place Royale may be made up of more than one building, but it is a sight to be seen as a whole. Stepping into the streets here feel as if you’re taking a step back in time to New France in its earliest days. The magnificent stone work, unique buildings, and old-timey feel offer an experience you’ll never forget. The Ramparts of Quebec City are the only remaining fortified city walls north of New Mexico. Parts of the walls were built as early as 1620, but have underwent multiple modifications over the years. The walls surround most of Old Quebec and have been declared a World Heritage Site, as well as a National Historic Site of Canada. The walls consist of nearly 8 miles of stone ramparts and still contain 4 stone gates. A visit to the Ramparts will allow you to explore the walls and get a one of a kind view of the city. These walls are filled with history from both the French and British colonial times and act as a very unique part of Quebec’s history. If you plan on visiting Quebec City, visiting the Ramparts needs to be on your to-do list. Not only will you get a birds eye view of the city from the walls, but you’ll get a chance to touch a part of history dating back to the early 1600’s. There are so many amazing sights to see in Quebec City, and no article could truly do them justice. What are some of the sights you would like to visit in Quebec? Leave us a comment with your thoughts in the section below.